NORMAN, Okla. (AP) – Lindell Wigginton scored 17 points to help lead No. 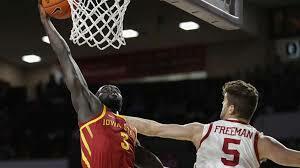 17 Iowa State to a 75-74 victory over Oklahoma. Marial Shayok added 16 points, 10 in the final eight minutes, including a crucial off-balance 3-pointer as the shot clock expired with 1:19 remaining, for Iowa State (18-5, 7-3 Big 12).